After months of denial, the New York Mets finally admitted to a popular suspicion: the team’s finances have been materially impacted by its ownership group’s involvement in the Bernie Madoff investment scandal. 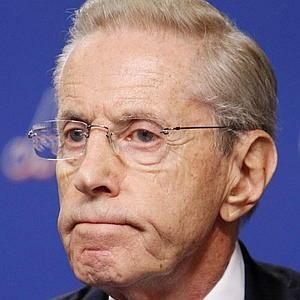 Fred Wilpon's ownership of the Mets could be derailed by his involvement in the Bernie Madoff investment scandal. Ironically, however, the impact isn’t a result of how much money was lost, but how much was gained by investment companies like Sterling Equities that are controlled by owner Fred Wilpon and partner Saul Katz. At the same time Madoff defrauded others out of approximately $20 billion, Sterling and a myriad of other Wilpon-related entities are believed to have netted well into the hundreds of millions. What might seem like good fortune to some is, in reality, a very sticky situation for Wilpon and his business partners. Why? Because Irving H. Picard, the trustee appointed to fairly distribute remaining and recovered assets, has filed a lawsuit to recoup the ill-gotten gains. In addition to the over $300 million in profits that Wilpon’s holdings are alleged to have received, a New York Times report recently stated that Picard could seek close to $1 billion if it is determined that the companies’ conduct contributed to the fraud in any way. Although the $1 billion figure seems fanciful, the $300 million number is probably a pretty good ballpark figure. If you take 25% (the approximate percentage in the team the Mets are interested in selling) of Forbes’ $858 million valuation of the ballclub, you get just over $200 million. So, based on this piece of circumstantial evidence, it seems as if the sale is intended to meet the lawsuit’s potentially substantial obligations. In the meantime, the named defendants have petitioned a judge to prevent the terms of Picard’s lawsuit from being made public. Despite the dire circumstances faced by the Wilpons and their investment partners, the ownership group has maintained that there shouldn’t be any adverse impact on the day-to-day operations of the Mets. The team’s current round of cost cutting would seem to dispute that contention, but the poor state of the franchise would probably dictate a pull back anyway. However, Commissioner Bud Selig is concerned enough about the situation to have called Wilpon onto the carpet to discuss the Mets’ finances. Interestingly, this isn’t the first time Selig has injected himself into the Mets’ affairs. According to new GM Sandy Alderson, it was only with Selig’s “urging” that he decided to pursue the Mets’ opening in the first place. Considering all that has unfolded, one wonders if Alderson wouldn’t like to have his own private meeting with the Commissioner? While the Mets sort through their financial woes, the outlook on the field is not much better. Barring unexpected production throughout the roster, the Mets are poised for at least one or two years of rebuilding. As a result, the financial impact of more losing seasons, combined with the Madoff fallout, could effectively spell the end of the Wilpon family’s majority ownership of the Mets. Regardless, an even bigger concern is the possibility that the team’s brand could suffer a longer lasting blow that would tuck it away even further into the Yankees’ shadow. Even when the Mets were brand new, they didn’t have to take a backseat to the Yankees. New York had first been a National League town, so there were thousands of former Dodger and Giant fans just waiting to embrace a new team in the senior circuit. As a result, by 1964, the upstart Mets managed to outdraw the four-time defending A.L. champion Yankees. Since that time, however, the Mets have seemed to be vulnerable to wild attendance fluctuations that usually coincide with their performance on the field. In that respect, the Mets are really no different from most teams, except, of course, for the added disadvantage of sharing the market with the Yankees. 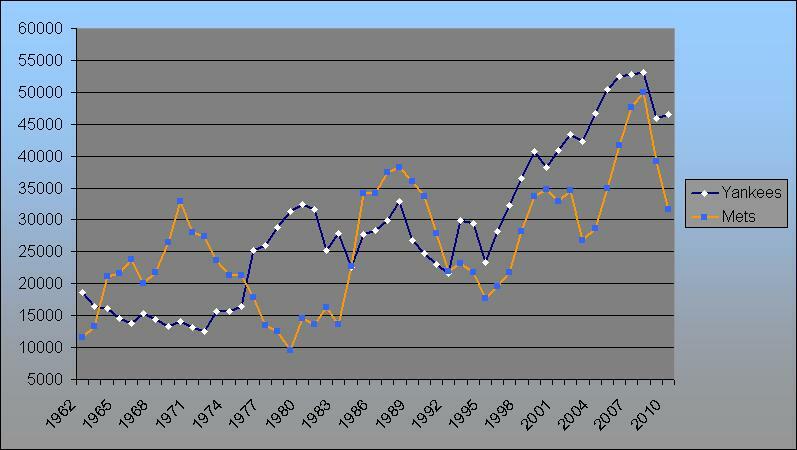 Since the Mets entered the National League, the Yankees have had two notable down periods (1965-1973 and 1989-1992). During those years, however, the Yankees managed to maintain their attendance figures in a relatively narrow range. In fact, in 1990 when the team lost 95 games, the Yankees still managed to the top the two million mark. What should be particularly worrisome to the Mets, however, is that the Yankees’ best play, and therefore greatest attendance gains, has come during down periods for the Mets. During these periods, the Yankees have enjoyed extended growth, and, because they have demonstrated an ability to hold onto their fan base, there has been less opportunity for the Mets to take these fans back. In 2010, the Mets’ experienced a 19.2% per game attendance decline (in 2009, attendance declined 21.6%, but that was mostly because of CitiField’s reduced capacity), which was a significant blow to a team just two years into a new stadium (not to mention all of the corresponding debt service). Meanwhile, across town, the Yankees keep on trucking. Although Yankee Stadium’s capacity doesn’t allow for a much higher average attendance figure, in today’s media age, the Mets still run the risk of having SNY fall even further behind YES. In many ways, the Yankees have created a vacuum in the New York market, and if the Mets don’t turn things around quickly, they could get sucked in. Because New York is first and foremost a baseball town, the Mets will always be just one or two good seasons away from an attendance rebound. However, if their goal is to at least approach the Yankees’ popularity and financial clout, they’ll need to quickly get their own economics squared away so Alderson can begin the task of restoring order on the field. It remains to be seen if the Wilpons will have the financial wherewithal to oversee this conversion, but if it is determined otherwise, a prolonged sale process could wind up being the real disaster.